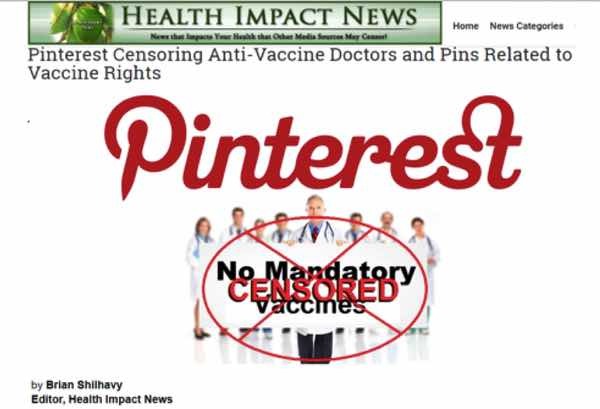 A recent article stating that Pinterest is deleting users’ boards if they post material questioning vaccine safety has been circulated on social media. The story that Pinterest censors users was also covered last year in several articles. So asking the question should we be concerned that people are being prevented from discussing vaccine safety?, of course, would seem asinine, but I fear this story reveals more than just the disturbing plague of censorship that has taken over social media, big corporations and government recently. She and her colleagues conducted research that suggested a rise in negative posts about vaccination on Pinterest, compared to prior studies looking at other social media. 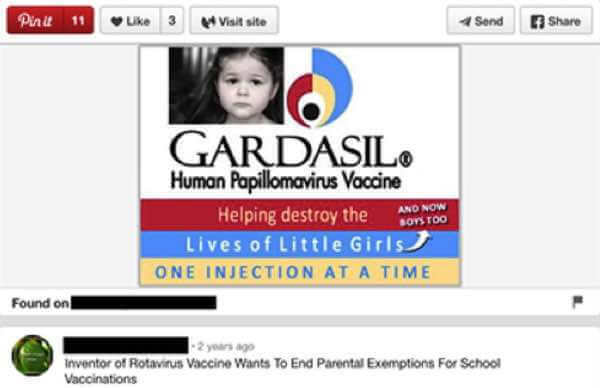 20 per cent of vaccine-related posts on Pinterest referred to conspiracy theories, like this pin suggesting Gardasil is aiming to harm children with its HPV vaccine. researchers are resigning over the removal from its board of leading researcher, Professor Peter Gøtzsche (pictured), for daring to challenge biased and faulty research from the same group used to promote the HPV vaccine. The details of the Professor Gøtzsche story, coupled with the voluminous articles and research challenging HPV vaccine safety, paint a very different picture from that portrayed by Guidry and her colleagues – a picture of serious harm and death following the use of the HPV vaccine, reflected in those Pinterest boards, which have now been deleted, in part as a result of Guidry’s research. It’s a picture based on real life events and real science, not vaccine pseudoscience. But of course, regardless of the science, those experiences have to be deleted because researchers like Guidry and her colleagues would deem them to cause “real harm”. Real harm to what, exactly? They would say: to other girls and boys that need the vaccine. I think the mounting evidence suggests otherwise: real harm to the vaccine industry. Tragically, what is never apparent or on the “radar” of researchers like Guidry, is that science, particularly vaccine science, may actually be corrupt or biased and therefore unreliable. And that those people posting on their vaccine boards, before they were deleted, may actually be telling the truth about the harms caused by the vaccine. A priori, researchers always approach the subject of vaccination with the assumption that it works and that it must not be challenged. I say “a priori” because any attempt at real scientific research or debate on vaccine safety and its true epidemiological effect is lost in the fog of historical assumption mixed with biased design and biased statistical analysis, corruption and censorship of the truth, collectively creating a pseudoscience. This vaccine pseudoscience or Scientism, which we now have by the bucket load, is now being used to censor anyone that disagrees. This Scientism, which does not just affect HPV vaccines as we have covered in other articles, is also linked to the censoring of free speech. The HPV vaccine, at the time of writing this article, is still not proven to prevent cancer; and HPV has not been definitively proven to cause cancer. And although it may be still too early to see any impact on cervical cancer rates, e.g. malignant neoplasm, from the HPV vaccine, we should be seeing a decline in “pre-cancers”, but a look at the Office of National Statistics data from the UK, for example, demonstrates an opposite picture— those cancers are going up. That observation was also shared by a paper published recently demonstrating an increase in cervical cancer possibly linked to the HPV vaccine in Sweden. But are the negative Pinterest posts on vaccines justified? Some think so: even in this dark time of Scientism and censorship, brave scientists are standing up for science and the truth. A critical review of randomized trials and post-marketing case series revealed significant harm from using the HPV vaccine and demonstrated that the risk to benefit equation was firmly in the risk column, supporting the view that this was a vaccine to avoid. But what researchers like Guidry are concerned about is that those anti vaxxers simply aren’t checking-in with the right sources. Considering the potential harmful health consequences for those who are not vaccinated, it is concerning that very few of the linked external websites refer to a government website like the Centers for Disease Control and Prevention or a medical website. There are many references to scientific fraud at all levels of the medico-pharma complex, including institutional, but none more telling than the recent controversy over the Centers for Disease Control (CDC) whistle blower Dr William Thompson. After hearing the details of that story, where CDC senior researchers destroyed evidence to make a vaccine look safe; and historical experimentation by the CDC on African-Americans, that endured unnecessary suffering, pain and death, is it any wonder that those deleted vaccine boards contained little reference to the CDC and other institutions like it. But “anti vaxxers” are now facing another threat – the charge of mental illness. Because if they happen to disagree with the vaccine pseudoscientists, regardless of whether they are right or not, then they must be mentally ill. Because in this post truth world we can’t disagree with scientists, governments or corporations like Google, Facebook or Pinterest. It’s heresy, just like it was for those that knew the earth went around the sun: you’d better not let on, and nod in polite agreement when they tell you that modern day Galileos questioning vaccine safety are fools. Here is a selection of replies from Pinterest to people that had their Pinterest boards, criticising vaccines, deleted. Oh well, that’s just a standard reply, I hear you say. But it’s a standard reply questioning the recipient’s mental health and sent because they questioned vaccine safety. Many articles have already covered the redefining of those questioning vaccine safety as vaccine hesitant, and coined the new collective term Vaccine Hesitancy, which has become a science in itself. Government funded organisations are tracking social media and analysing why people are vaccine hesitant. The concern is: will it stop there or will Vaccine Hesitancy be developed into a new disorder that requires help? If you didn’t agree with the powers that be, then you were diagnosed with a mental illness and removed from society. During the leadership of General Secretary Leonid Brezhnev, psychiatry was used to disable and remove from society political opponents (“dissidents”) who openly expressed beliefs that contradicted the official dogma. Could this really happen? What are researchers saying that are tracking social media? In 2010, when [Michael] Paul and his co-author, Johns Hopkins University Associate Professor Mark Dredze, first considered the possibility of mining social media for data, Twitter was only four years old. The two wondered if people ever discussed health issues on the platform, which led them to write a paper outlining the ideas that have driven much of their work since. The terms anti-vaccination sentiments and mental health issues like suicide prevention are now being considered in the same sentence both by researchers and social media corporations. Coincidence or worrying trend? “To me it’s actually impressive how well-organized and sophisticated the anti-vax movement has become,” said Dr Peter Hotez, the director of the Texas children’s hospital center for vaccine development at Baylor College of Medicine, and the father of an autistic child. Hotez, who maintains an active Twitter presence, said he struggled to identify whether Twitter accounts were human or [Russian] bots. What of normal people, then, just attempting to get to the truth? Or is everyone that dares to think for themselves associated with mental illness or a Russian bot? recently been submitted to the WHO during its session on Vaccine Safety in Rome: https://www.efvv.eu/open-letter-to-the-who-from-international-organisations/. I urge you to read this letter signed by over 130 international organisations with more requesting to sign every day. Vaccines are NOT safe, are NOT safety-tested according to standard drug testing rules (no real placebo has ever been used), and the number of adverse events occurring worldwide is both shocking and deeply distressing. Your decision to classify ‘anti-vaccination advice’ as ‘misinformation detrimental to a Pinner’s health or public safety’ is in itself profoundly misinformed and as such a form of hate speech. I am deeply disappointed to learn that Pinterest is so biased, and as such will cease using your platform and urge others to do the same unless this statement is withdrawn. Please read the Open Letter to the WHO, do your research and due diligence, and educate yourselves before banning evidence-based and fully-referenced areas of science. I also draw your attention to the UK’s Vaccine Damage Unit, which has paid out £74,000,000 to 950 people whose severe disability has been caused by adverse reactions suffered after vaccination. Most other countries in Europe and the US have the same. The US for example have paid out 3.5 billion dollars. With all due respect and appreciation. The Japanese government withdrew its recommendation to use human papillomavirus (HPV) vaccines in girls June 2013, citing concerns from the public about adverse effects. Until they can rule out a causal link with the HPV vaccine, they find it responsible not to recommend this vaccine. To date they have not proved or disproved a link past a strong association, yet thousands of previously healthy girls in Japan have reported new serious health events post vaccine with no diagnosis and no cure, some in wheel chairs, and sadly some no longer living. The UK and the US and most other countries are still using this vaccine. The Rotavirus vaccine is for an infection which doesn’t cause death in babies in the developing world. It is an infection seen less in breast fed babies. Therefore, isn’t it good public information to share that France linked the death of two boys to the Rotavirus vaccine and suspended this vaccine, and offer the evidence that breastfeeding reduces incidence of this infection? Babies are given 7 vaccines at the same time at 8 weeks (and if they follow the schedule they will have received nearly 50 vaccines by the time they leave University), yet the Italian Committee looking into Uranium for answers to why their personnel were suffering poor health found actually an association between administering more than 5 vaccines at the same time. These vaccines are given at the same dosage as is given to babies. The recommendation is that the Italian military do not receive more than 5 vaccines at the same time. https://drive.google.com/…/1WuCxYpIwQJFjh1fzwLXgf6krtOEESFUQ; p. 154 Findings from the Italian Uranium Commission (7.2.18) that the number of vaccines administered together should be limited due to the increased risk of autoimmune disease. The UK and the US and most other countries are still recommending more than 5 vaccines at the same time. So, can you kindly assess carefully and answer, is sharing this information classed as ‘anti vaccine advice’ according to Pinterest to be censored, or is it the public sharing of global events and personal experiences necessary to exercise caution in vaccine vigilance and health and safety? If you feel as strongly about this blatant attack on freedom to speak the truth and discuss important matters such as the health of our loved ones, then you can contact Pinterest here and let them know. You can’t pick and choose which types of freedom you want to defend. You must defend all of it, or in the end you’ll have none.